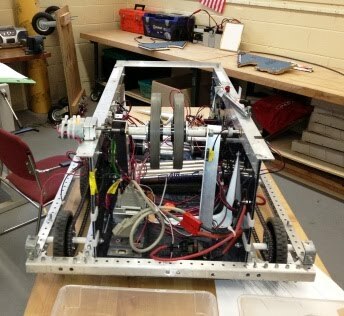 This Fall, SharkByte and the McDevitt Robotics team visited two local colleges. The team spent an afternoon at Manor College in Jenkintown, Pa with the Manor Tech Club. Our team and the Manor Tech Club members exchanged ideas about robots and robot design. We gave a demo of SharkByte and explained how SharkByte was constructed and how it works. Here is mentor, Mr. Burke with the Manor Tech Club. The Tech Club was impressed with SharkByte's bridge tool. Here a club member is able to lift SharkByte from the teeth, showing how 60 psi locks the teeth in position. Thanks to McDevitt Alum and Manor Faculty member Norma Hall for organizing this event. Later in the month the team visited Arcadia University, which sponsors our team by supplying us with a build site on their campus. We spent day in the Arcadia Commons showing off SharkByte to the students. Interest was very high and many students stopped by to take a turn at driving. We are very thankful to Arcadia University for their support and were happy to share our success with the Arcadia students. Both of these events were very benifical to the team. Part of the mission of FIRST robotics is to inspire team members to pursue careers in Science and Technology. Making visits to college campuses helps the team members visualize the possibility of these careers for themselves. The trip to Arcadia was the last event for SharkByte, for when we returned to our build shop, we began to take SharkByte apart so that we can use the components for the 2013 season. We will be attending the 2013 season kickoff on Jan 5th. From that date we will have 6 weeks to design and build our next robot. Wish us luck. Here is SharkByte as he is being taken apart.